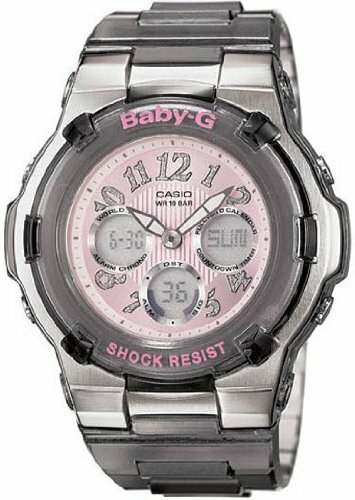 Cuddle up with this charming Baby-G Star from Casio. The brown resin accented with rose-gold tone is a perfect for any style and the versatile analog digital display keeps you on track. . . . . Shock Resistant . . 100M Water Resistant . . LED Light with Afterglow . . World Time: 29 time zones (48 cities), city code display, daylight saving on/off . . 5 Independent Daily Alarms . . Hourly Time Signal . . 1/100 second stopwatch . . . . Measuring capacity: 59,59.99 . . Measuring modes: Elapsed time, split time, 1st-2nd place times . . . . Countdown Timer . . . . Measuring unit: 1 second . . Countdown range: 1 minute to 24 hours (1-minute increments and 1-hour increments) . . Others: Auto-repeat, time-up alarm . . . . Full auto-calendar (pre-programmed until the year 2099) . . 12/24 Hour Formats . . Button Operation Tone on/off . . 3 Alarm Patterns . . 00-Second Animation on/off . . Accuracy: +/-30 seconds per month . . Battery: SR726W x 2 . . Approximate Battery Life: 2 years . . Module 5001 . . Size of case: 43.6 x 38.9 x 13.1mm (approximately 1 1/2") . . Total Weight: 42g . .